We have talked a lot about the hands and their importance, but we have one more hand related subject that must be covered before we move on. That is the handshake. In many western countries when two people meet they will usually shake hands. 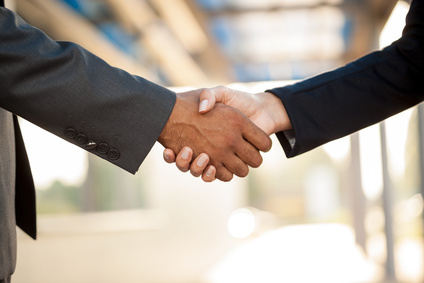 Just like first impressions, your handshake will leave a lasting impression. Have you ever shaken someone’s hand and it was either overly strong like they were trying to crush your hand, or worse yet, weak and flaccid like a dead fish? You remember those don’t you? Can you recall the time, place, occasion and the person who gave you that handshake? If you are like most people, you probably remember them, but not for the right reason. So… the first reason to learn to do a handshake correctly is so that you are not remembered in such a negative way. The second reason to give someone a proper handshake is that it shows that you are equals and glad to be there with them. Who doesn’t like to know someone is glad to see them? The last reason to reach that hand out and make contact is that when you shake someone else’s hand (or make most any kind of positive physical contact) you both release a hormone called oxytocin. When you make that connection and oxytocin is released you instantly feel more connected to that person on a physical and psychological level. That is a big win. How big? Studies have shown that you could talk to that person on the phone or in person for hours having a fantastic conversation and still not build the feeling of connection that happens in the time it takes to do a simple handshake. Shaking hands creates a connection and helps build trust. So I have established the what and why, now let’s work on the how. Hold your hand vertical and move your hand into theirs so that the webbing between your thumb and index fingers meets theirs. Give a good firm handshake to start with and try keep it within 10 -15% of the pressure they are giving you. I usually will give a somewhat firm (but not crushing) handshake, but if they are not meeting my firmness I will back off to meet theirs and if they are trying to crush my hand I don’t escalate. Don’t adjust down to the dead fish level, but you may have to back off a bit if the person is a brain surgeon or someone who needs to shake your hand but is still a bit guarded against an overly strong handshake. Pump hands up and down 3 times (per normal etiquette) going up and down about the distance of the two hands or around 4-6 inches and then let go. Perfect this skill by practicing with your friends. Occasionally I get asked the two following questions about handshakes. What if the person holds their hand out palm down, or if they hold it palm up? What does that mean? When someone is trying to shake hands and they hold their hand out with the palm down, they are saying they are the dominant or more important person. Depending on the time, place, person you can either let it slide and just shake their hand that way or you can grab their hand with both of your hands and twist them vertical with a smile on your face. Another technique is to take their hand and then put you other hand on their elbow and apply just the slightest bit of pressure to turn it all vertical. Like I said earlier… Levels of complexity and technique. If they have their palm up they are saying they are subservient to you. You see this a lot with sales people or folks in the service industry. They are indicating that they are at your service or you are the more important one in the exchange. That’s all there is to the mechanics, but there are also a couple of things that you should make sure of before engaging in a handshake. Make sure your hands are as clean as the situation calls for. If you and someone are working on cars together a little grease is ok, but not in the board room. Make sure your hands are dry. If you are at a networking event or someplace you will have a drink in your hand, put it in the one you don’t shake with or put a napkin around it. If appropriate, smile look them in the eye and use their name. It helps tremendously with the connection and helps you remember their name if you are meeting them for the first time. That is everything you need to know for about 85% of all handshake interactions you will ever have. You now know the what, the why and the how of giving a proper handshake and making a great impression every time. Calling by name has a immense psychological effect .Everybody like their name .Calling by name will help build connection . That is absolutely correct! Using a persons name is very, very important. Great comment!